I never understood why it was important to make a ''Best Of'' Nirvana, when they only had 3 albums (4 if you count Incesticide). Buy their albums instead, and you won't miss out on some of their strongest tracks like ''On A Plain'', '' Aneurysm'', ''Scentless Apprentice', '' Drain You'', ''Territorial Pissings'', ''Breed'', and the list goes on. And why they didn't put on the unplugged version of About A Girl, I really don't get either. The tracks on here is good though, but tracks like ''You Know You're Right', The Man Who Sold The World'' and ''Where Did You Sleep Last Night'', does not really belong on this collection. Super quiet 180g reissue. Doesn't have the last 2 tracks as the original or include a inner sheet, but for €10 I can't complain. Great compilation to own. not 16 titles, no 5.1 , what a ripoff. . This Nirvana collection features most of their great songs which any fan can adore. If that is simply all you want then look no further. After listening however, I felt like it mostly delivers what it promises as a release, but ultimately does not impress either. The songs sound fine for the most part but seem to not be tampered or remastered very much. Some are seemingly taken straight from their live recordings without adjustment, resulting in what you could call flat or compressed sound. Im not one to use adjectives for describing music but they could have done a lot more to bring Nirvanas music to life. 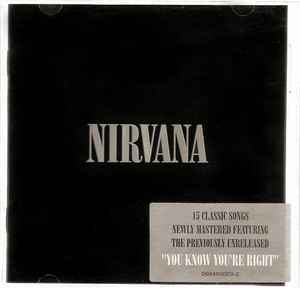 The sleeves are much like the music very simple and straightforward, a black cover with Nirvana on it. No extra content except the download code. There is nothing that I would call bad about this release but nothing to praise either. But I suppose Nirvana never really was an audiophile band. Still above average and Im sure the 45RPM double disc issue will bring the dynamics and clarity up a notch, go for that if changing records and speeds doesnt bother you. The legendary alternative rock band Nirvana almost single-handedly brought the subculture of ' grunge ' to the mainstream. Their second album Nevermind (breakthrough) was released in late 1991 and early 1992 reached the first place of the American album lists, where they established competitors like Michael Jackson and Dire Straits were behind. Cobain then struggled with his new role as spokesman for a generation. His struggle with heroin, and the tempestuous relationship with his wife Courtney Love — of the band Hole — also claimed their toll. The less polished successor In Utero confirmed the quality of Cobains song writing, although the album does not have the same commercial impact. His tragic suicide in april 1994 deprived the world of a huge talent, but the legacy of recordings continues to exist. In October 2002, stormed the collector Nirvana — a "greatest hits album" — to the highest echelons of the British and u.s. charts, selling over a million copies a month. It seems catalog number should be 493 523-2 and not 606949352325 which is barcode number. Is this supposed to include any credits sheet like the U.S. pressing? All I got was the record in a poly-lined inner sleeve and the download code. Purchased newly and sealed from a big chain store. At least I got it real cheap for 10 Euros. Can others confirm if they did/did not receive a voucher to download the album? My copy did not come with one. Seriously though, how good does this pressing sound? I'd never bothered with any recent / amped up pressings of Nevermind, so to hear Teen Spirit on this pressing was remarkable. A quality job!